Xerox Color 800 Press delivers sharp, rich, digitally mastered image quality. The clear dry ink station adds impact to documents – running at rated speed. The Automated Color Quality Suite of tools allows us to drive more high quality jobs through our shop. This is the perfect solution to your large and small, black-and-white print runs. Our printers ensure a high-quality finish on your product. The Envelope Ink Jet Printer is a high-speed printer that is not only used for addressing on envelopes, but also for a full-on print. 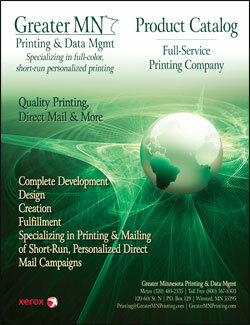 Anything on an envelope can be printed at Greater MN Printing. 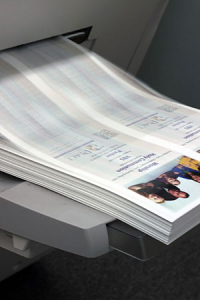 With the bookletmaker, it is possible to quickly and efficiently create multiple page, stitched and folded pamphlets and brochures. It automatically collates, folds, and stitches booklets quickly and error-free to ensure that your job is completed correctly and on time. Our coil binder enables us to punch the holes and insert the coil binds on books. The DC-645 is the ideal finishing solution for digital color documents. Unlike any in the industry, the DC-645 slits, cuts, and creases documents in a single pass at an incredible speed of 26 sheets per minute. Our hydraulic paper cutter enables us to make precise cuts to large amounts of paper at a time. The tabletop folder is used to folder a variety of different documents from half folded programs to tri-fold brochures. Contact us today to see if we can create your custom fold. This folder is used for large folding projects. It has the ability to complete folds much more complex than the simple tabletop form. We love the options it gives us in the print shop. Our paper padder is what is used to glue together NCR forms and notepads. The shrink wrap machine in our shop will have your project result in a professional presentation. A drill press is used to punch a hole in paper. Usually it is used to punch booklets to fit in a three ring binder or to punch a single hole in a calendar so it maybe be hung up. Our Unibind equipment allows us to glue together the Unibind books. Our stitching machine is used for hand stitching together books for raffle tickets and when need hand stitching booklets together.